This is the first piece in a while in which I haven’t included any collaged elements. I whipped it out in just two weeks. It reminded me of how time consuming all that paper can be. Isn’t it funny how always trying to be the same can result in flailing around with your head cut off? The presence of chaos, rather than order, is the more common outcome of conformity. 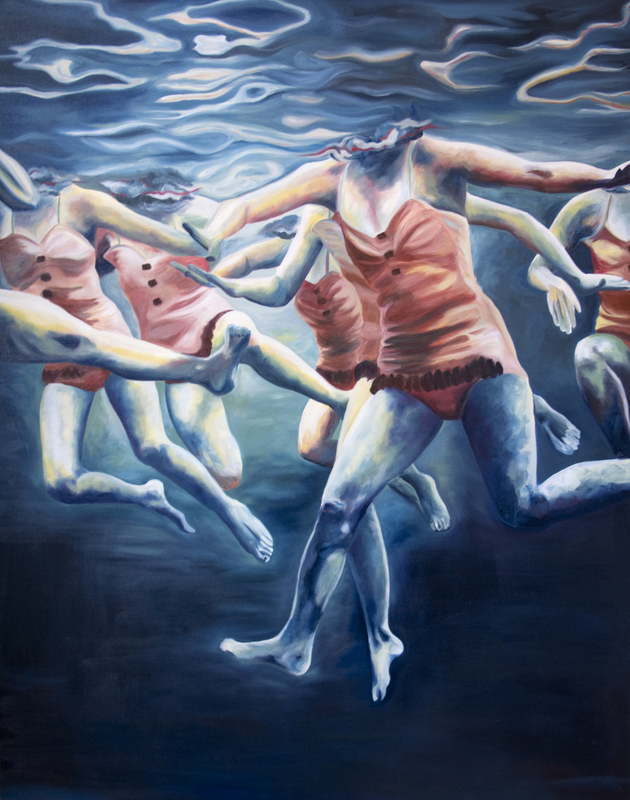 I used synchronized swimmers as a representation of conformity to explore this concept. An underwater vantage point reveals the intricate imperfections of the illusion of unity on the surface. I painted much faster and looser than normal to produce movement and the bright colors were selected to create an abstract feeling of struggle while showing the beauty that lies in our differences. After all my years in the water, your piece just looks like a memory. Very nice! I find myself looking for the shark in the dark waters nearby.